For reasoning about uncertain situations, we have probability theory, and we have logics of knowledge and belief. How does elementary probability theory relate to epistemic logic and the logic of belief? The paper focuses on the notion of betting belief, and interprets a language for knowledge and belief in two kinds of models: epistemic neighbourhood models and epistemic probability models. It is shown that the first class of models is more general in the sense that every probability model gives rise to a neighbourhood model, but not vice versa. The basic calculus of knowledge and betting belief is incomplete for probability models. These formal results were obtained in Van Eijck and Renne . van Eijck, D.J.N. (2015). 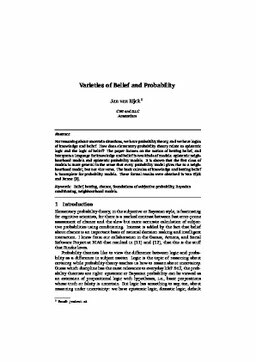 Varieties of Belief and Probability. In S Ghosh & J Szymanik (Eds. ), The Facts Matter --- Essays on Logic and Cognition in Honour of Rineke Verbrugge (pp. 67–87). College Publications.